Looking for the perfect Bequia beach? Well everyone, locals and visitors alike, have their favourite. We highly recommend exploring them all and picking your own favourite(s). We’ll be adding pictures of our favourites soon, so please bookmark and come back again. Our Bequia accommodation - The Nest – is ideally located close to several excellent Bequia beaches. Plantation House beach is less than 10 minutes walk, Princess Margaret beach about 15 minutes and Lower Bay about 20 minutes. 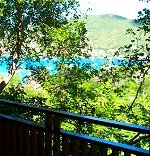 The veranda at The Nest offers spectacular views of Bequia beaches and bays.